I enjoyed editing this picture far too much. The word "cute" was never in my dictionary of descriptive words for foods. Desserts were the only exception... until I discovered the Japanese world of bentos. Bentos are basically meals packed in boxes. Usually, if the bentos are made for kids (or 16 year old sisters), they're all vamped up with "kawaii" (cute) things like animal shapes and hearts. Now, this specific dish isn't in a bento because I don't particularly have any bento boxes at home, but it still looked adorable. Ever since I started school, from kindergarten all the way to university, I have been surrounded by Asians. So, it's no surprise that I'm quite familiar with and very appreciative of all sorts of Asian cultures from Chinese to Japanese to Korean. The kawaii culture of the Japanese has always been at the top of that list. I mean come on, who doesn't love Hello Kitty and all the other Sanrio characters?! And the Rilakkuma or Relaxing (sleeping) bear character is no different. His adorableness is to an extreme. When I saw this tutorial for how to make Rilakkuma omurice, I knew I had to make it. And who better to make it for than my omurice-loving sister. Omurice is a Japanese rice dish made of rice cooked in ketchup and wrapped in an omelet.Yumm. Even my brother was fawning over Rilakkuma and his little friend. Heat cooking oil in a frying pan and saute the minced onion until tender. Add cooked rice and stir-fry. Then season with ketchup and salt. Beat 2 eggs in a bowl. Heat cooking oil in a pan and make a thin omelette. If you don't have a rectangle omelette pan, you can make a circle thin omelette and cut it later like I did. You can make 3 sheets of omelet using these 2 eggs and use one as a spare. Wrap some ketchup rice in a sheet of omelette to make a pillow. Use a plastic wrap and form the ketchup rice into the body parts of Rilakkuma. Then put together. Use a chicken nugget to make a Yellow Bird (Kiiroitori). I used a salmon burger patty and cut it into the yellow bird shape. 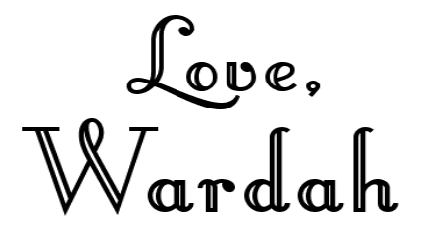 I covered it with a cheese single for a better coloring. You can also put plain rice under the bird to balance him out. Make a beak with carrot and black sesame seeds. Cut two thin strips of Nori to make his head feathers. Make the bear and bird's sleeping eyes with a Nori sheet. 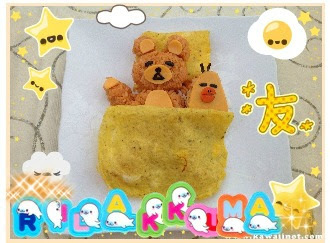 Decorate the details of Rilakkuma using sliced American cheese and Nori sheet. Put a sheet of omelet blanket over them. Garnish with sausages, cooked broccoli, and cherry tomato. Serve with ketchup if you like. Ahhhh so so cute! Make me some!! !